Residents and tourists in Al Ain witnessed a spectacular car show, the first of its kind in the city, showcasing more than 500 bikes and customized cars, aimed at encouraging youths specially lovers of cars to make it their hobby. Danat Al Ain Resort, the jewel of the Garden City of Al Ain, is the proud sponsor of the Love Emirate Events organised by Street Custom Show and Emirates Bikers Magazine. 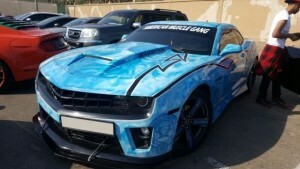 The parade was viewed by more than 1500 spectators who were all amazed to see a huge number of customized cars and bikes coming together to Al Ain.